You Can Run a Marathon! : Madrid Marathon Splits! Rock 'n' Roll madrid Marathon Official Time: 4 hours, 35 minutes and 41 seconds!! 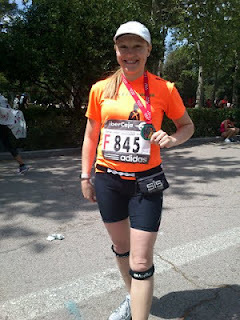 A quick blog post of my Madrid Marathon splits! You can see from the below data that I was a little slower towards the end. That's because the last 7k were up, up and up!! It was fantastic!! Even better than Valencia! Wow. Congratulations. I just started running and losing weight before I turned 50. I can't even imagine running all those marathons. What an inspiration! It was a fantastic race! !